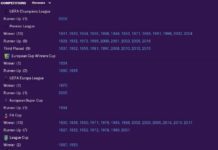 When I decided to take on the Arsenal save, I wanted it to be as all-encompassing as possible, including adding almost every league available. The few I left out were Singapore, Indonesia, Hong Kong, and any other of the smaller Asian leagues. Normally they offer little-to-no viability down the road when you get deeper into the save. If you remember back to the introduction to this, I had briefly discussed the certain directives I wanted to give myself. I am not able to go into my squad assessment and my decisions for recruitment, sales, and scouting just yet (that comes in the next piece), but I will be looking at a few other goals and parameters I gave myself for it. 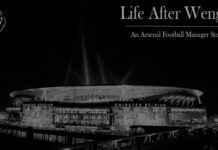 Note some of my details – it’s likely an American would never manage Arsenal (despite Stan Kroenke ownership) and as such, I wanted to make myself more appealing. My affinity for German football and my knowledge base of it gave me a reason to play around a bit with my profile. Both my parents are/were in medicine, and Landstuhl is home to US military facilities; particularly the hospital there. My nation of birth would end up being Germany but my primary nationality was American. This gives my character a better in-game knowledge base of Germany to reflect my real-life knowledge of it. Considering that Arsène Wenger was not a footballer of high stature during his playing days, I made my past playing experience as a professional only. 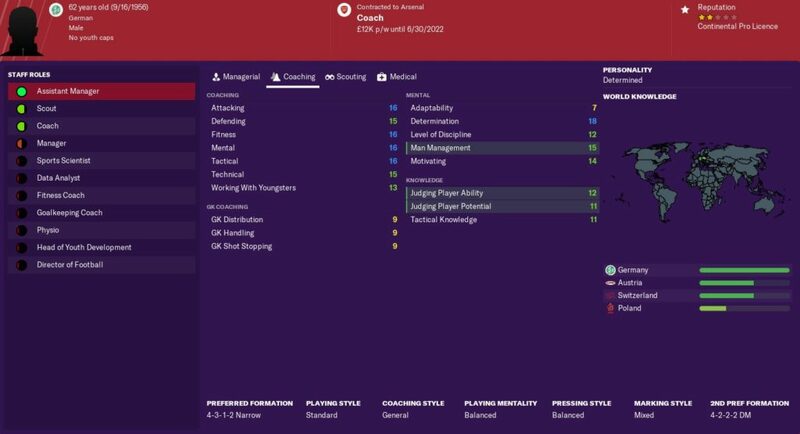 It is always fun to try to taper your managerial profile to fit the nature of the save you are doing; at least I think so. If I was managing in the Eredivisie, I likely would have given myself some sort of knowledge of it through that profile. I may have even upped some of my youth ratings to reflect the history of youth development in the national footballing psyche. These pretty much fall right in line with Arsenal’s real-world expectations for Unai Emery’s first season in charge, so, for now, I am more than happy to go along with it. Realistically, this should be straightforward, at least in the League. You would have to say I am an early favorite for a run in the Europa League as well, given club stature and recent history. This allows me to adhere to the financial plans I have set forth for myself, which I will go into further detail in the next piece. I often feel as though this area of Football Manager saves is overlooked in some regard. Coaching and efficient staff make or break a football club in terms of on-pitch results. Having the best players in the world can only go but so far. Recent readily examples of this come via Wenger’s final years as well as Jose Mourinho at United. Football is constantly changing. Behind any successful manager, these days is a highly effective and capable team of coaches, analysts, scouts, and everything in between. While many like to do everything as much as possible in FM, having the best backroom possible is a no brainer. For a club the size and scope of Arsenal, it is absolutely vital. It is a bit harder to maximize your staff at a smaller club, either because you cannot attract the higher echelon staff, or you just simply cannot afford them. Arsenal doesn’t have this problem, so putting together a staff with the highest possible pedigree is easy on paper. I was shocked to find that quite a few on the books were not rated nearly as high as I expected. An example of this is Shad Forsyth. Understood to be one of the best sports performance/scientists in the business, his rating in that category was 11/20. Not only would he unexpectedly be binned, but quite a few others needed to be shown the door and replaced, as well as filling in existing vacancies. For a bit of nostalgia, I tried to bring in former players if it was possible. Seppo Eichkorn is my new coaching love. High wages for a first-team coach but worth it. A new coach I happened upon this time around is Seppo Eichkorn, who is arguably the best free agent coach you can find. Coincidentally, he is one of the best-rated coaches overall in the entire database. If you are at a big enough club, he will accept being a coach and not an assistant manager as long as the wages are tempting. Another cheeky shout, who you should be able to bag off free agency even if you’re not an elite club, is Anders Storm; that is if you need a Head of Sports Science. He is mountains ahead of Forsythe for example, and only spending ₤2k/week wages made him a must. Most importantly was that Dennis Bergkamp made his return. DB10 on the books as a coach, considering his tenure at Ajax as Frank de Boer’s assistant, is fantastic stuff. It also affords me the potential to promote in-house and move him to the assistant role that he is familiar with. If you find yourself struggling to find the best backroom staff, or maximizing the ones that you do have, there are plenty of resources online to help you with this. 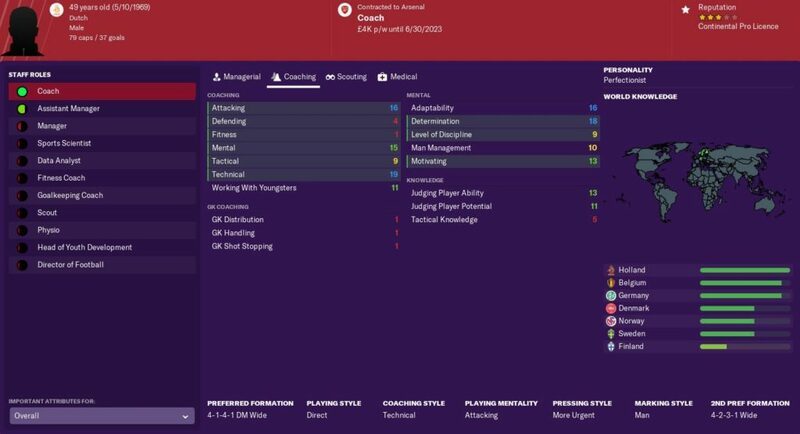 Checking out Football Manager Blog and their list of assistant managers will give you a perfect place to start if you need to look for a new lieutenant. It is always worth taking enough time to find the right staff for what you are trying to achieve. For me, this is the first thing I do whenever I start at a club. Getting the right coaching staff, as well as key roles such as data analysts and sports scientists, will help you focus in on what tactical system you’re actually capable of running. All the rest falls into place far easier in its wake, and it should help you build a nice foundation moving forward.